Welcome to Steak 101. I know it seems pretty basic. Most people would say that there’s nothing to cooking steak. Just throw it on your grill, or in a pan, and cook till done, right? No, no, no! There’s a science behind a perfectly cooked steak. Want to get that perfect char and a juicy, medium-rare interior? Just follow a few simple steps down the path to great steak. Before we even get into the kitchen, let’s talk about purchasing your beef. There are many magnificent cuts out there – porterhouse, New York strip, rib eye, shell steak, just to name a few! 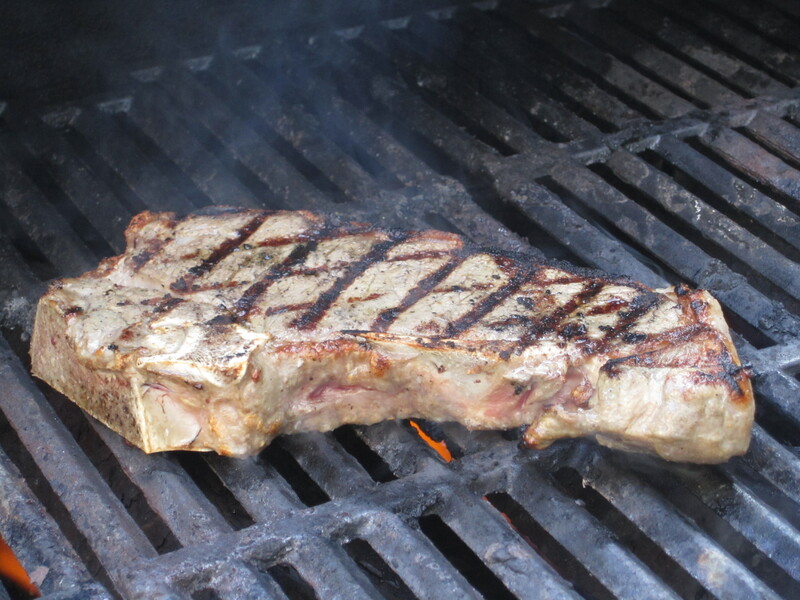 Whichever cut you prefer, your steak should be one-and-a-half to two inches thick. This will allow you to sear the exterior to a perfect crisp while leaving the interior pink. What was that? You prefer your steak well done? Blasphemy! Nothing, and I mean nothing, is more succulent than a medium rare rib eye. Don’t dare tell me otherwise! But, if for some reason you encounter someone who wants their steak well done (like your mother-in-law who insists she likes her steak to resemble a little nugget of charcoal), use a thinner steak so the outside doesn’t burn while the interior has a chance to fully cook. Once you’ve purchased your steak and brought it home, cradled in your arms like a newborn, it’s time to prep it. If you’re planning to cook the steak the following day, make sure to refrigerate it. Take the steak out of the fridge about an hour before cook time. Lightly sprinkle both sides of the steak with kosher salt. That’s right, I said kosher salt. Put away the iodized table salt. In fact, just throw it away. That has no place in your kitchen! Table salt is extremely salty. Nowadays, most recipes call for kosher salt, so substituting table salt can have disastrous results. Allow the steak to sit out for about half an hour to a full hour, bringing it to room temperature. It may look like your steak is merely resting, but the salt is actually amplifying the flavor. It helps the cells of the meat retain water, which will make it tender and juicy. Allowing the steak to come to room temperature will activate enzymes that also tenderize the meat. Just before cooking, pat the steak dry with a paper towel. Season the meat again with kosher salt and some freshly cracked black pepper, then drizzle it lightly with some vegetable oil. Press the salt and pepper into the steak, making sure it adheres. 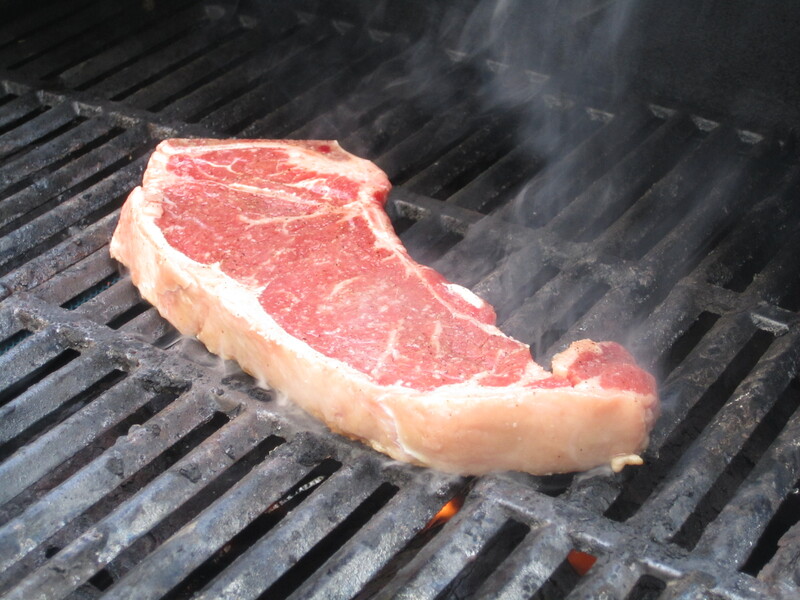 Once your grill is flaming hot, place the steak on the hottest part of the grill. Do not walk away! Close the lid on your grill. This will reduce flare-ups. After about 3 to 4 minutes, use tongs to flip your steak. Please, don’t use a fork. Poking holes in your meat will only result in the loss of juices. We definitely don’t want dry steak, do we?? After flipping the steak, continue grilling for an additional 3 to 4 minutes with the lid closed. If you don’t have a grill, or just prefer cooking indoors, you can definitely cook your steak in a cast iron pan or large skillet. Just be sure to get the pan nice and hot to ensure that perfect sear! Transfer the steak to a cutting board. Do not cut into it! If you do, all those precious juices will come flowing out. Allow about 5 to 10 minutes for your steak to rest. This will give time for the juices to distribute throughout the meat. Find something else to do to pass the time. Pour yourself a drink. Rearrange your DVD’s. Whatever. Just don’t cut into that steak! Most of the time, I like to keep things simple and eat my steak as-is, with just the salt and pepper. In some steakhouses, steaks are served with a dab of butter on top. Sometimes, I like to create a flavored butter, like the blue cheese butter shown above, just to change things up a bit. Want to do the same? 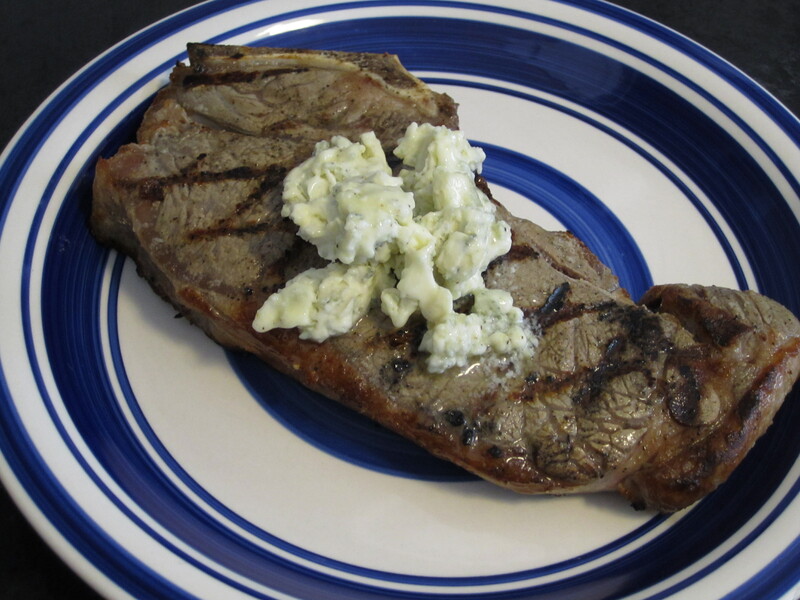 Just combine a few ounces of crumpled blue cheese with some softened butter and a sprinkle of salt. Seriously, though, 99 out of 100 times, I prefer my steak with just salt and pepper. No fancy marinades. No secret spice rubs. Just a nice char on the outside and a gorgeous, juicy, pink interior. Yum. Most people assume that since I grew up with a butcher, I frequently eat fancy cuts of meat or turn my nose up at the “plain” stuff. Not true. In fact, I prefer the less expensive cuts, the kind of stuff used to create good, old-fashioned comfort food. Take chicken fried steak, for example. It’s made with cube steak, also known as minute steak, which is a cut of beef, usually top round or top sirloin, that has been tenderized. I’ve made cube steak plenty of times, usually pan-fried and smothered in sauteed onions. Today, I decided to have a go at chicken fried steak. First off, my husband loved this recipe. 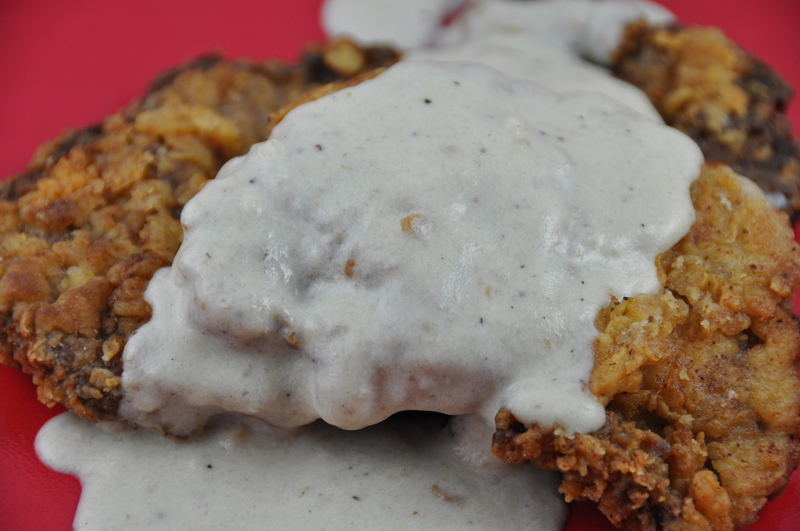 It’s not hard to believe, since chicken fried steak is just steak that’s been coated with seasoned flour and fried. John loves anything fried. Seriously. But, moving on… While experimenting with this recipe, I kept noticing my husband making excuses to appear in my kitchen. I would turn and see him peering over my shoulder, eyes squinted, trying to get a glimpse of the fried deliciousness. When my test batch was finally done, John quickly appeared by my side, offering to snap a few photos for my blog. Of course, after those pictures were taken, he quickly ate the photo subject. With a smudge of gravy near his mouth, and a full stomach, my husband promptly proclaimed that my chicken fried steak was a hit. Place 2 cups of the flour into a baking dish. Combine the flour with the garlic powder, paprika, salt, and pepper. Place the eggs into a separate baking dish and combine with 1/2 cup of the milk. Dredge the meat on both sides in the flour, then the egg, then the again in the flour. Make sure to shake off the excess flour. Repeat with all the pieces of meat. Let the meat rest for about 15 minutes before cooking. Heat 1 inch of oil in a heavy-bottomed (I prefer cast iron) skillet and set over medium-high heat. Once the oil starts to shimmer, cook the steak in batches. Make sure not to overcrowd the pan. Doing so will cause the temperature of your oil to drop, creating a soggy steak. That’s not what you want! Cook each steak until golden brown, about four to five minutes on each side. Repeat this process until all your steaks are cooked. In a separate skillet, cook the slices of bacon. Snack on the bacon while making the white gravy. With the skillet still on medium heat, add the two tablespoons of butter to the bacon fat. Once the butter is melted, add the two heaping tablespoons of flour and whisk for one or two minutes. Slowly add the remaining 2 cups of milk. Whisk until the milk comes to a boil and the gravy thickens. Season with salt and pepper. Continue to whisk until the gravy is nice and thick, about 8 to 10 minutes. Serve the gravy over the steaks. Tastes delicious with a side of mashed potatoes.